It's been almost a month since the last of these Catchup reviews, which is pretty good going for me at the moment. Check out 11 really good beers in this review and let me know your thoughts if you've had any of them. Later that night I head to The Local Taphouse for the Almanac launch. Farmer's Reserve Citrus unlocked two badges Pucker Up (Level 28) & Land of the Free (Level 45). It was quite late, but I thought this was a bit less sour than some of the other Almanac offerings and consequently was dangerously drinkable. Thankfully I've got a bottle to sample on a clean palate one day soon. I've made it abundantly clear in the past that English Bitter's are not my favourite style of beer. For some reason the stupidly shaped St Peter's Organic Best Bitter bottle made it's way into my fridge and had been causing havoc ever since. Naturally I took one for the team and sampled it. At first I quite enjoyed it's caramel malts and lightly herbaceous hops, however over the full course I found it became a little cloying. You're Extra Special (Level 20 is why you're reading about it. Liberty Citra is one of my absolute favourite beers. It's close to perfect for my palate, with plenty of tropical fruit & citrus flavours coming through over the quite solid malt backbone. There is heaps of bitterness, but the beer remains beautifully balanced. I reviewed this be in full over 18 months ago, which you can check out here. Mardi Gras (2016) was the badge. Little Creature Pale Ale earned another badge, I believe this to be the fourth badge that this beer has unlocked. On with the Show is a badge for checking into theaters, cinemas etc. and a going away drinks at Rooftop was the reason for this badge finally being unlocked. Anywhere you can get Little Creatures for less than any other beer by the pint is fine by me. As usual the beer was excellent! 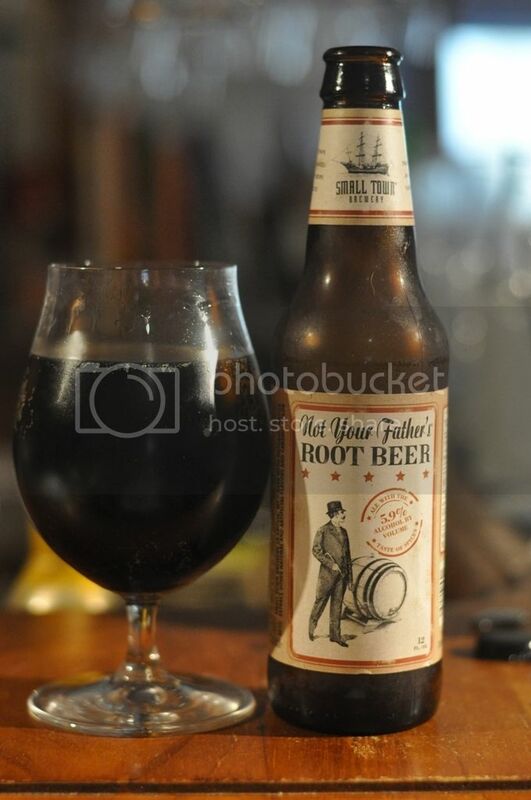 Not Your Father's Root Beer was one of the most divisive beers I can recall from last year. The boys at Acland Street are always good at getting this sort of thing in and they didn't let me down this time. Not having had a Root Beer before I didn't really know what to expect... I actually really enjoyed it, once I got past the distinct Deep Heat aroma! It's got sweetness, this odd herbal quality, some cherry and cola. I would recommend trying it if you get a chance. This beer unlocked the badge of the same name. Well done Small Town Brewery for introducing me to the world of Root Beers! I know it's early in the year but one of my most highly anticipated beer releases of the year was the Bridge Road & Doctors Orders Spontaneous Fermentation 4-Pack. Basically it was 4 Berliner Weisse's with different fruits added. The first of these; the SF-Base, was exactly what it sounds like - the plain Berliner Weisse. It was a lovely example of the style, which was slightly sweet, slightly sour and very crisp. Pucker Up (Level 29) was the badge. Not unexpectedly Better Together (Level 10) came along in the Spontaneous Fermentation pack. SF-Raspberry was the last one of the pack that I tried and was probably the most interesting. This beer at times was far and away my favourite, and at others tasting a bit disappointing... I can't remember a beer that changed back and forwards as much as this one. It was sweeter tan the other beers in the pack, with great raspberry flavour and mild tartness. Sixpoint Hi-Res is a huge IPA, over 10% ABV, which recently had a badge - Sixpoint Hi-Res View - that you could unlock by checking in to two Hi-Res'. This beer is brilliantly balanced despite it's monstrous, sweet malt body. Accordingly there are plenty of hops and at 115 IBU's it's very bitter, despite what my previous review says. If you want more details about this beer, read my review from 2014 here, which was a slightly different version admittedly. So there we have it guys, another Untappd Catchup review done and dusted. Work looks like it is finally settling down a little bit now, and accordingly I'm hoping to get a few full reviews up in due course. Please let me know if there is anything you would like to see me try or if you've got any thoughts on the beers above. Cheers guys! I've been getting a few emails about that recently. I've got a draft that I've started. Is there anything in particular you're interested to know about it? I'm a tulip glass man myself so feel free to chuck in your top 5 tulips too. Thanks for the feedback. You'll see a finished product in a week or two hopefully.